We whooped it up for National Night Out while we were in Tucson, spending the evening with my family and their neighbors. We prepped and planned a bunch of tasty food and drinks around our party theme – “We’re Going to Have Fun Whether it is Real or Fake.” It proved to be an effective theme, and we totally succeeded in having both Real and Fake Fun. One of the key components to planning both Real and Fake Fun are hats. 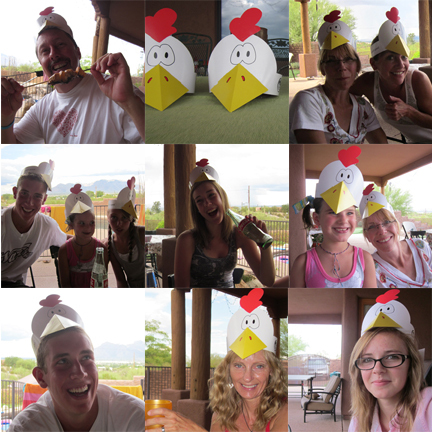 For this party, we utilized chicken hats, courtesy of Gold’n Plump Chicken. Chicken Hats = Immediate Festivity. Since we were planning for a crowd, we used two Gold’n Plump family-sized packages of chicken breasts. This recipe makes quite a big batch (see printable version of this recipe for quick reference chart to reduce the size of this recipe for less people), and the exact number of skewers and orange wedges needed varies based on how big or small you cut up the chicken. So, if you’re the kind of person that needs EXACT numbers for cooking, this recipe will likely give you a headache. If you’re a flexible person who “ballparks” instead of “measures”, this recipe will work fine for you since you’re probably loosely following it anyway (for you: pork is awesome instead of chicken, and you could skip the oranges if you felt like it, and you could just use whole pieces of meat if you don’t feel like all that cutting, and if you decide at the last minute to order pizza instead of cooking I would totally approve). One of the things I like about this recipe is that it requires little prep, some time while the chicken soaks up the marinade, a little assembly time, and they grill quickly. 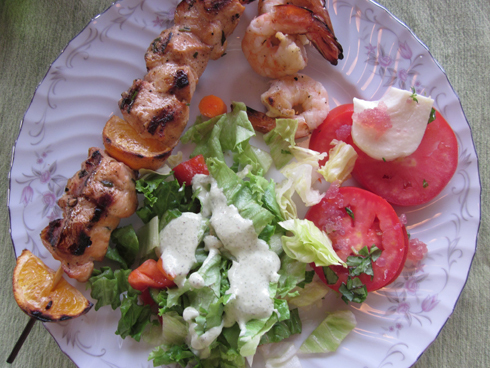 In no time at all, you have a beautiful tray of kabobs ready for dinner. 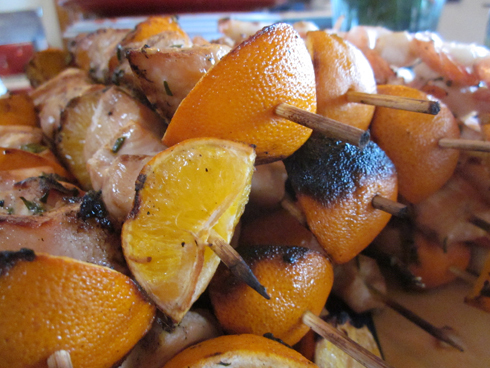 The orange and rosemary flavors are delicious with the chicken, and grilled oranges are surprisingly tasty. This is also a very flexible meal, and can take on a wide variety of sides. We were super lucky and had a delicious caprese salad topped with vinegar pearls (SCIENCE! IN THE KITCHEN! ), and salad topped with basil green goddess dressing (totally divine, recipe available here, this batch courtesy of Valla). Combine orange juice through garlic in a pitcher and stir to combine. 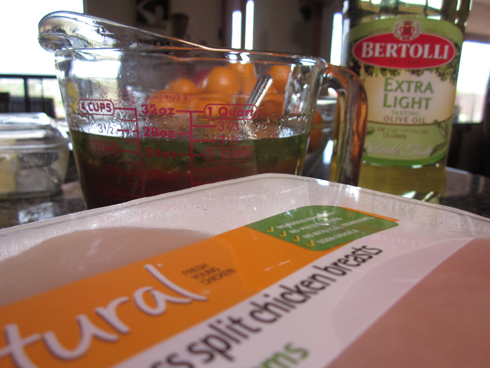 Place all of the pieces of cubed chicken in a large ziplock bag then pour marinade into bag. Close tightly and refrigerate for at least an hour. While chicken is marinating, soak bamboo skewers in water for at least 30 minutes. Starting with an orange wedge, thread it on a skewer, three pieces of chicken, an orange, three pieces of chicken, and finish with an orange. Repeat until all of the chicken has been skewered. Grill over medium-high heat for about 4 minutes a side. Test to be sure that the chicken is done before serving. These look great! Nice to have found you! kat – you can eat the orange wedges! they are also tasty when squeezed over the chicken to add a little extra flavor. Yum, yum, must make blah, blah, blah (and of course I actually WILL make these bc it works for both my tastebuds and style of cooking) when all we really want to know is HOW do you make vinegar pearls?